EnglishDost (2014-17) was an award-winning app to learn conversational English speaking skills through regional Indian languages for blue-collared workers using storytelling. The product was used by more than a 1 million people and it had an organic growth of 70%. The startup won many accolades including "Top 8" at Google Launchpad and part of Facebook India's SMB council. It was also featured and covered by multiple publications such as Yourstory, Quartz, inc42 etc. I was a founding team member and lead the user experience across all products under the English Dost umbrella. I also contributed to the UI overhaul of the Android app, co-designed a scalable learning framework, designed a mentor app MVP to track self-practice of students, hired and mentored junior designers, and contributed to project management. Incorporates variable practice to avoid boredom. As a solo designer and working in an agile environment, I had limited resources so I had to prioritise on what gets build based on impact. We used Human-Centred Design principles using a mix of mock classes along with rapid prototyping to iterate and test the framework. 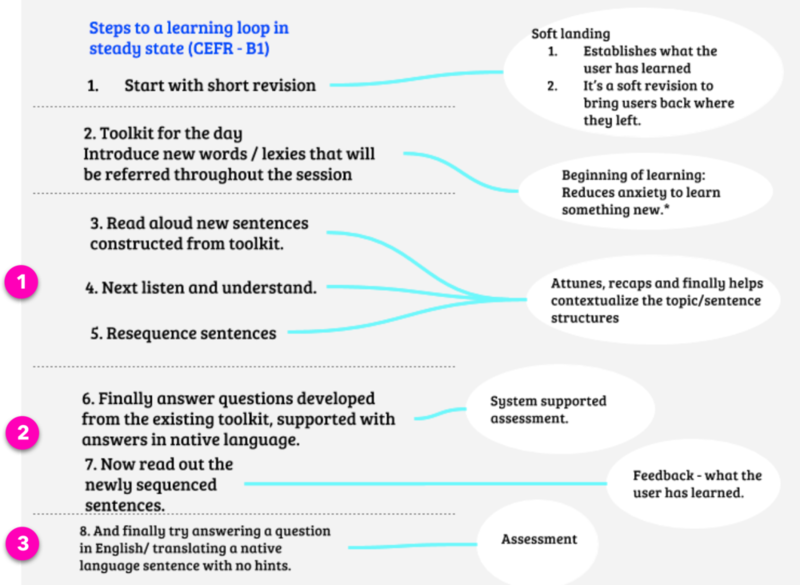 For the prototyping, we used CEFR as a reference for gauging learning outcomes. Eventually the framework became the reference on which the content team build new learning modules for it's blended teaching. It was evaluated in an offline class of 50+ students. The framework was used as a reference by the content team to create content strategy to accommodate evolving business specific requirements. Above: This is a map showing the gaps before incorporating UX in the learning framework. The last column shows the lack of metrics to understand the success of the teaching content. Above: A mock learning framework that incorporates #1 practice, #2 system-supported assessment & #3 feedback. It was created by using CEFR as a reference for gauging learning outcomes. Above: Sample of a content from on-boarding flow.